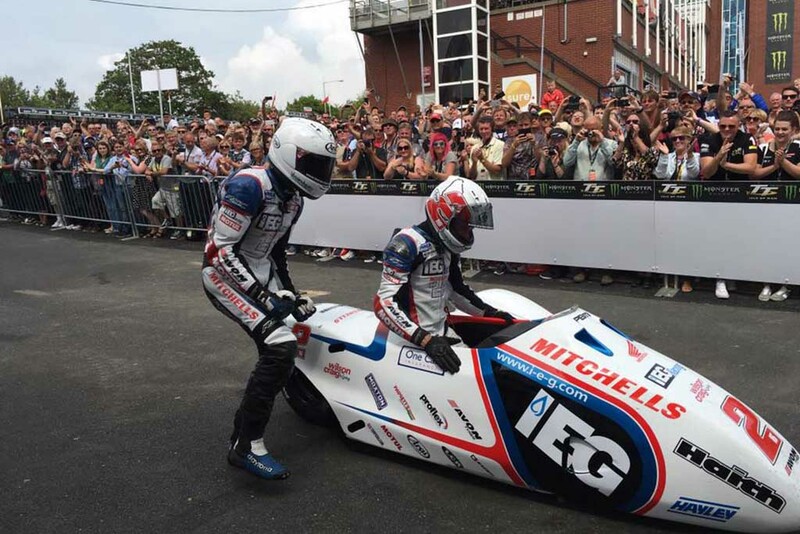 After suffering a huge disappointment in the first Sure TT sidecar race, Ben and Tom Birchall were more determined than ever to take Fridays race by the scruff of the neck. As we waited for the start of today’s race, news filtered through that there was to be a delay to the start time, due to sea fog on the west of the Island. Originally, the race was planned to start at 10:15am but the race was delayed for over 3 hours before we finally got underway with a new start time of 1:30pm. 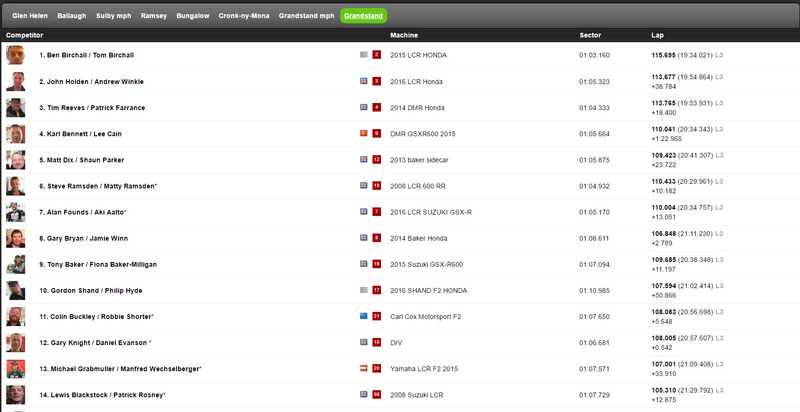 We had a full field of starters prior to the race but as 1:30pm drew closer, more and more teams started to withdraw. A whole host of teams announced that they would not be lining up for a variety of reasons but the main contenders weren’t going to miss this shot at TT glory. 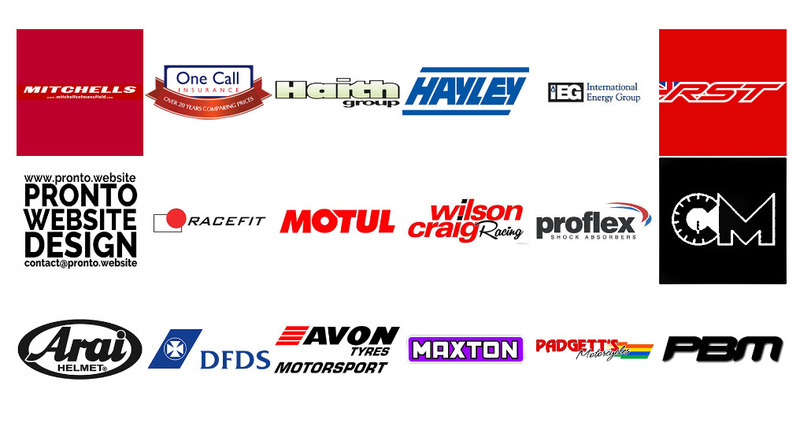 Unfortunately numbers 26, 27, 31, 32, 36, 45, 46, 48, 51, 52, 56, 57 did not make the start line, see the list below for the partially revised race line up. As the teams lined up, it was Ben and Tom Birchall who were set to start in second position behind Dave Molyneux and Dan Sayle. Ben and Tom were looking calm but determined as they waited for the signal to start this long awaited Sure Sidecar race 2. Manx radio grabbed a quick word with the brothers on the start line, just moments before they were due to set off. “Yeah we’re looking forward to it, there’s a great turn out and it’s going to be good to be out in front of all these fans. Hopefully, we can do better than we did on Saturday! And we’re away for the final Sidecar race of the 2016 Isle of Man TT. As they approach the first corner at Glen Helen, it’s Dave Molyneux’s outfit that comes into view first 1.542 seconds in front of the Birchall Brothers with Holden and Winkle right behind them. Ballaugh Bridge was the next time check on the road with Molyneux and Sayle coming through in pole position, ahead of Tom and Ben Birchall who were 2.360 seconds behind them, this left the IEG sponsored outfit in third place in the early timings but the star pairing from the first weeks qualifying sessions and race one winners, Holden and Winkle, were right up the back of the Birchalls LCR Honda. in third position on the road. At Ramsay, it was Holden and Winkle from Molyneux and Sayle with Ben and Tom rounding out the top 3, but with just 1 seconds separating the top 3 teams, we were set up for a fabulous race. As we went through Bungalow it was Molyneux and Sayle leading with Tom and Ben moving into second place in the timing and on the road but Holden and Winkle were also right there in the mix, with only fractions of a second separating the top three pairs. Cronk-ny-Mona saw the same three teams go through at the front of the race with the Birchalls on a charge, and as we made our way to the Grandstand to finish the first lap, it was Moylneux/Sayle and Birchall/Birchall that were starting to pull away from the rest of the field, with the Holden and Winkle slipping back to 3.745 seconds behind. As we breathlessly raced down towards Glen Helen for the second time, it was Molyneux and Sayle who led by the slimmest of margins, from the Birchalls who were now within sight of the red, Molyneux machine but a few corners later Ben and Tom were also ahead in terms of time. It looked ominously like Ben and Tom were finding their form from the first race and they began to grind down the deficit between themselves and the machine of Molyneux and Sayle. Ballaugh Bridge was swiftly dealt with by the front two teams, who were now right up against each other and battling hard for first position on the road. Molyneux had given away 3,238 seconds to the Birchalls as they looked to extend their time margin over the DMR Honda. Clocking 146.8MPH through the Sulby speed trap it was looking serious for the rest of the field as Ben and Tom started to tighten their grip on the race. With retirements coming thick and fast, it was fingers crossed time for the Birchalls as they pushed on regardless with the memory of Saturdays disappointment firmly in the back of their minds. Through the Ramsay hairpin it was the Birchalls who were stretching out their lead to 4.526 seconds. As they sped up the mountain, Molyneux and Sayle were in sight, it would now only be a question of time before they were caught and passed but tenacious work from Molyneux was keeping the Mansfield brothers at bay. Bungalow came and went in a blur of colour and noise as the Birchalls started to turn the screw, taking another second out of Dave Molyneux’s outfit, but the race was stretching out behind with the 3rd place crew having completely lost touch with the leading pair. Cronk-ny-Mona saw the gap holding steady at 5.542 with top speeds just a whisker away from the 120mph mark. As we went through the grandstand it was the Birchalls who now looked to be in full flight, not holding anything back, they catapulted across the line at a furious pace with a new lap record seemingly at their mercy, they made a second lap of 116.615, within a whisker of the lap record they achieved in the previous race. The final lap was at the Mansfield duo’s mercy and the appearance of the TV helicopter whirring away overhead, signalled that the fastest sidecar at this years TT was about to enter Glen Helen for the final time, it was, of course the pairing of Ben and Tom Birchall who appeared out of the murky distance first. Surprisingly Dave Molyneux was nowhere to be seen as Holden and Winkle sped past a good while later, it transpired that Molyneux and Sayle had retired with a mechanical shortly after the Birchall’s had passed them at Greeby, but the real news was that the leading pair had stretched out an incredible gap of 21.745 seconds now that the meat had been removed from the sandwich. Would thoughts now turn to machine conservation, in mind of race one’s early retirement? Not a bit of it! These boys are relentless and they shot through Ballaugh Bridge with a lead of 24.143 seconds, tearing another 2 and a half seconds away from their nearest rivals. 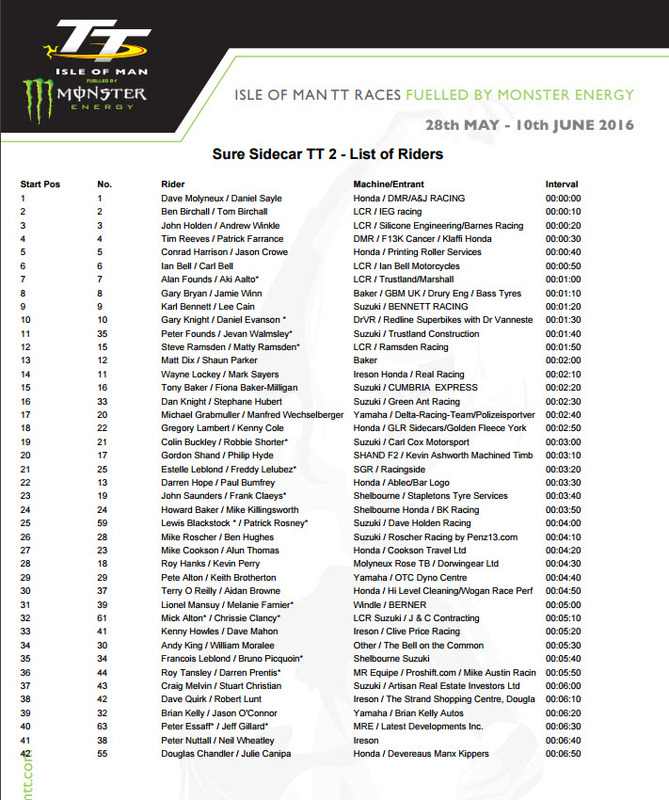 With news of an incident at Ballaugh spur it was obvious nothing but a red flag would halt the Mansfield duos charge and once again they came hammering through the Sulby speed trap at exactly the same velocity as the previous lap. It was clear that there would be no letup from the all conquering Birchall brothers. At the Ramsey hairpin, the boys were surely aware that they were in a commanding lead, but they weren’t hammering the revs when exiting the hairpin, was this a sign that machine conservation was now in Ben Birchalls mind? It wasn’t apparent that the brothers had noticeably slowed because again, they had now put yet more time into their nearest rivals. The final climb up the mountain was dealt with in impressive fashion by the LCR Honda and the Mansfield team were left with a seemingly unassailable lead. First again, through Bungalow, it was now turning into something of an embarrassment, as the boys murdered the competition with a performance that can only be described as remarkable. 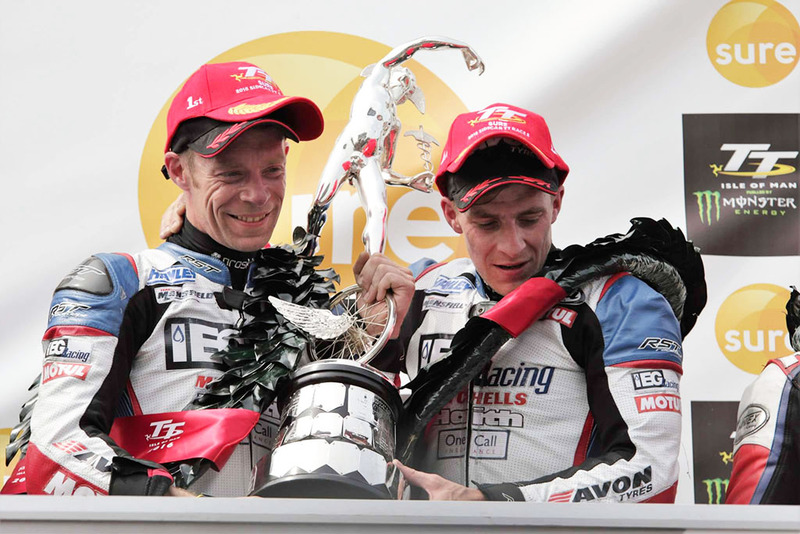 By now, it was only a matter of time before Tom and Ben were crowned 4 times TT winners and that proved to be the case as they ate up the road in front of them with the chequered flag poised to welcome them across the line. Ben and Tom Birchall crossed the line a mile ahead of their nearest rival to rapturous applause from everyone in the grandstand. What we witnessed here, this afternoon, was an almost faultless performance from one of the finest sidecar teams in modern memory. After crossing the line the brothers excitedly jumped into the air, hugging one another, their joy clear for all to see. Ecstatic family members, sponsors and supporters rushed to join them as they celebrated this remarkable achievement. 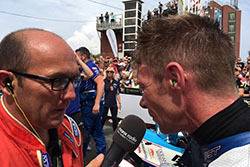 “I just thought, calm down now and I actually gave Dave Molyneux a kiss on the way through Greeby so I hope he’s alright, but I was just weary of what happened in the first race but today was so different, the bike was a bit sluggish at the start but as we got down the fuel we got quicker and quicker”. Absolutely jubilant, we were a bit steady to start with but as it is round here, we just waited for it to come to us and that’s what happened but the support on the last lap was awesome. 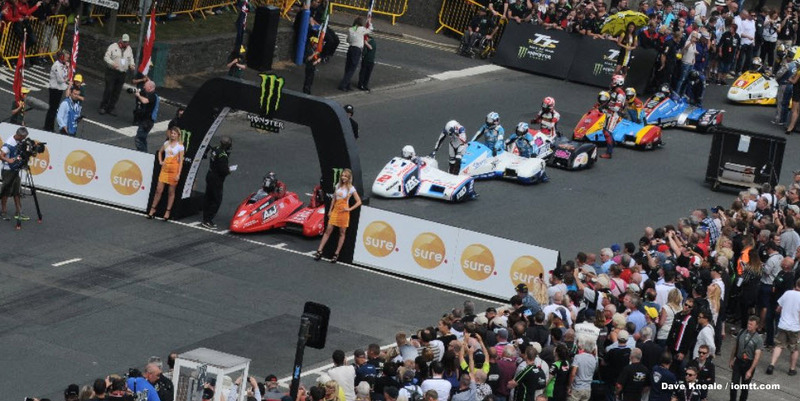 As the popular winners received an ovation from the crowd, the boys embraced once more and kissed the TT Sidecar trophy as they stood, victorious on the podium. A sweet moment after the devastation of not finishing the first race. 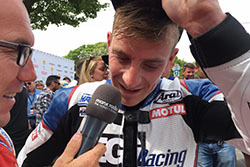 As the national anthem finished, the crowd gave generous applause and Champagne was sent sprayng through the air, as the celebrations continued unabated, Tom Birchall cheekily poured champagne inside the back of Tim Reeves’s leathers, helping to cool him down, no doubt. 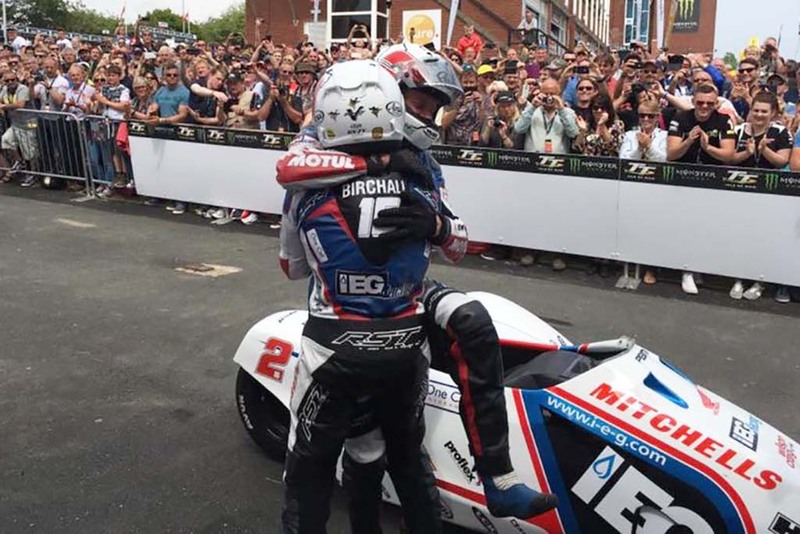 A fitting end to one of the best and most enthralling TT sidecar competitions in recent memory.